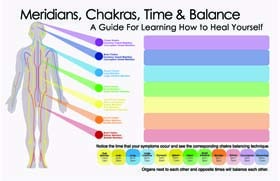 My Meridians, Chakras, Time and Balance poster began as an assignment in school. I went back to school around the time my second husband left our relationship and it offered me a time to regroup and heal from divorce. Going through a second divorce in some ways was easier than the first. In other ways it was harder. School helped to keep my mind occupied on constructive things and at the same time was a step I needed to take to reclaim my life in a way that I hadn’t even since my first divorce. A personal cancer experience, which I will share more about in later posts, led me to researching energy healing since 2008. I tell pieces of the story in the Guide For Learning How to Heal Yourself Booklet and Journal I have created since the poster. The booklet is available on my website. The journal and posters will be available soon. I researched the connection between the Chinese Meridians best known for their use in acupuncture and the Chakras which come from ancient HIndu texts and was astonished to find a connection to modern day physiology as well. While there are some who avoid chakras due to its roots in religion, I suspect that ancient texts of all kinds had information that people followed which benefited them. I know there is that kind of information in the Christian Bible and I have learned to be open minded as I am learning more and more about the science of how we are all connected. Adding the Chinese Time Clock gives you an additional source for guiding which balancing techniques you may need the most. It can guide you if you experience symptoms at a certain time of day. Maybe you have pain, get sleepy or even wake up at night. If you know that you are having a certain problem with a specific organ, then try the balancing techniques color coded to that organ. The most important thing to remember is to enjoy what you do. Some of the people whose material helped me create this guide include Judith Anodea, Paul Grilley, Carol Tuttle and Dr. Hiroshi Motoyama. This guide is by no means complete, it is just a piece that may help you on your journey. It is helping me on mine. This entry was posted in Uncategorized and tagged Balance, Chakras, Chinese Meridians, Chinese Time Clock, Healing on February 26, 2013 by bigartventure.